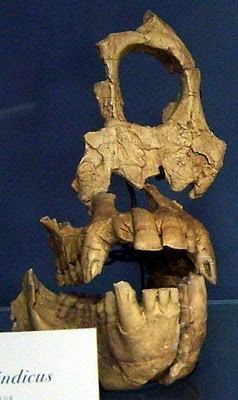 The mandible of Khoratpithecus piriyai from Chaimanee et al. (2004).. Scale bar equals 1 cm. 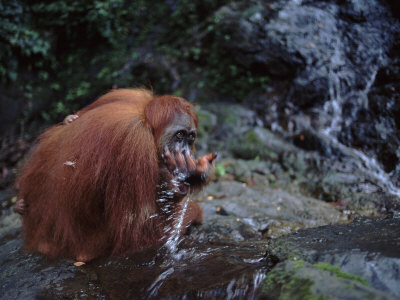 Sumatran orangutan Pongo abelii drinking while neatly concealing her baby. 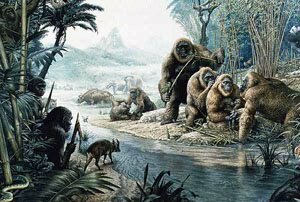 Photo from here..
Reconstruction of Gigantopithecus troop. Image from here. Comments: Contemporary with early humans. Relatively few fossils are known; most of the material are molars from Chinese traditional medicine shops, although several jawbones are known. 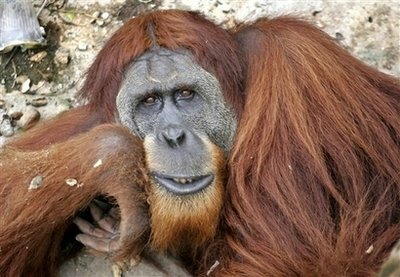 The largest species, Gigantopithecus blacki is the largest known primate. However estimates heights of upto 3 metres and weight to 540 kilograms are probably exagerrations. The species was highly sexually dimorphic, with adult females roughly half the weight of males. It probably inhabited bamboo forests, since its fossils are often found alongside those of extinct ancestors of the panda. Most evidence points to Gigantopithecus being a plant-eater. 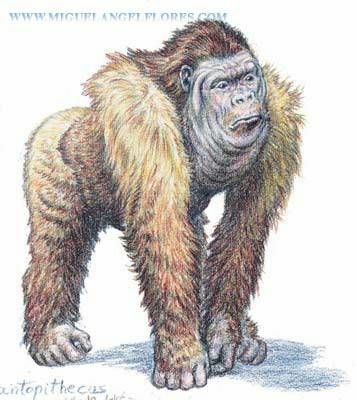 At one time Gigantopithecus was thought to have been related of humans, on the basis of similar morphology of the molars; this has turned out to be a result of convergent evolution.